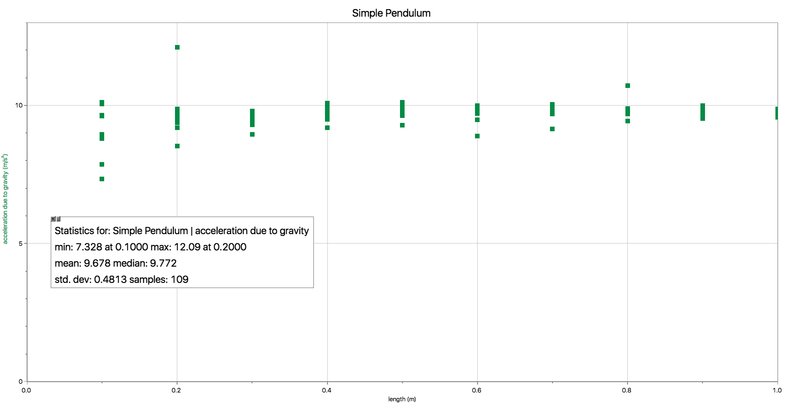 A "seconds pendulum" has a half period of one second. It takes one second for it to go out (tick) and another second for it to come back (tock). What is the length of a seconds pendulum at a place where gravity equals the global average value of 9.81 m/s2? What is the period of this same pendulum if it is moved to a location near the equator where gravity equals 9.78 m/s2? How much time does the pendulum lose or gain every 30 days? What is the period of this same pendulum if it is moved to a location near the north pole where gravity equals 9.83 m/s2? How much time does the pendulum lose or gain every 30 days? A classroom full of students performed a simple pendulum experiment. They attached a metal cube to a length of string and let it swing freely from a horizontal clamp. They recorded the length and the period for pendulums with ten convenient lengths. Use these results to determine the acceleration due to gravity at this location. There are two basic approaches to solving this problem graphically — a curve fit or a linear fit. Let's do them in that order. First method: Start with the equation for the period of a simple pendulum. Compare it to the equation for a generic power curve. Set up a graph of period vs. length and fit the data to a square root curve. Use the constant of proportionality to get the acceleration due to gravity. 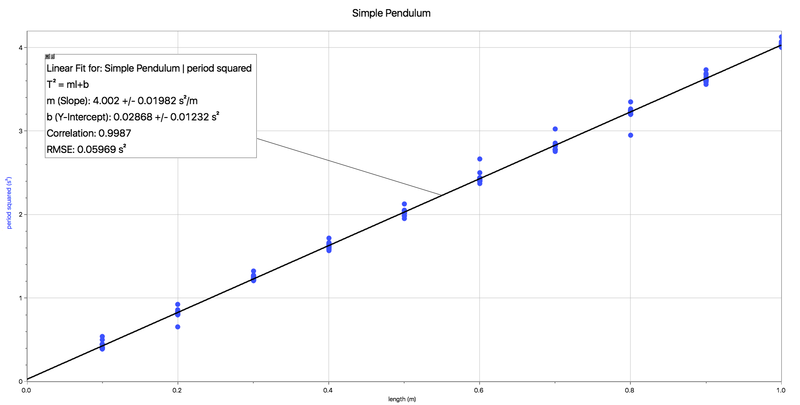 Second method: Square the equation for the period of a simple pendulum. Compare it to the equation for a straight line. Set up a graph of period squared vs. length and fit the data to a straight line. Now use the slope to get the acceleration due to gravity. 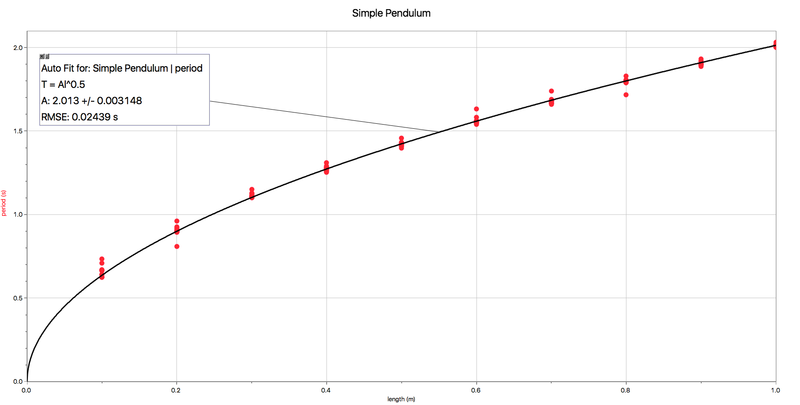 Bonus solutions: Start with the equation for the period of a simple pendulum. Solve it for the acceleration due to gravity. Compute g repeatedly, then compute some basic one-variable statistics. This method isn't graphical, but I'm going to display the results on a graph just to be consistent. The most popular choice for the measure of central tendency is probably the mean (g bar). But the median is also appropriate for this problem (g tilde). How about some rhetorical questions to finish things off? Which answer is the right answer? All of the methods used were appropriate to the problem and all of the calculations done were error free, so all of them. Which answer is the best answer? That's a question that's best left to a professional statistician. What is the answer supposed to be? The answers we just computed are what they are supposed to be. The problem said to use the numbers given and determine g. We did that. What is the generally accepted value for gravity where the students conducted their experiment? I think it's 9.802 m/s2, but that's not what the problem is about.